I'm looking for not expensive DC barrel female connector that can handle 8A of current. I found only barrel jack 5.5x2.1mm which can handle 3A, I couldn't find anything similar. But same type of connector(but male) can handle 10A of current. Why? Why female jack can't handle 10A but male can? High-current barrel connectors are tricky. Generally the current capacity is determined by contact area between two mating surfaces. More area means more current. A mating plug usually has a simple cylindrical geometry, with no springs or splits. When plugged in, the bottom spring contact pushes the whole plug to one side (up in this case). As one can see, the contact bewteen outer jacket and spring is made only in one point. 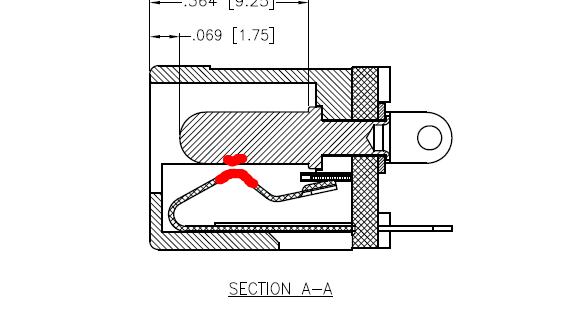 At the same time the center pin of the barrel jack gets in contact with hollow center connector of the plug, so again it touches it either in one point or one line, the red dot marks the spot. 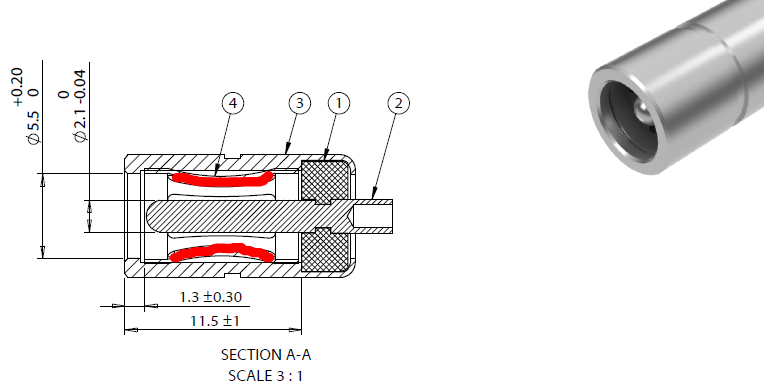 In essence the contact is made by pinching between one-sided spring and the center pin, which makes this kind of connectors relatively tolerant to diameters of pins and barrel sizes. However, the contact surface is not that big, contact resistance is high, power loss leads to contact overheating, which sets the limit for ampacity. However, there appear one important caveat to consider. If the outer barrel has symmetrical springs around, this will center the entire plug symmetrically. If you are not using the mating plug from (preferably) the same manufacturer, the inner pin might end up with no contact at all. So the mating plug should have a special design as well to make a good contact. Either the inner hole in the plug should have springs (or fork-like design instead of just round hole), or the center pin in the barrel jack should have a split springy body, so it get squeezed when mates with the hole in plug. This construction requires better tolerance to part's dimensions, and is usually more expensive to make. But it does have better ampacity. ADDITION: The following video from Tensility is a good illustration of differences between various contract designs. The female connector includes a spring, which puts pressure on the contacts. The higher the pressure, the higher the current the connector can be rated for. The spring used in the females you've seen so far limits the current to 3A, even when mated with an ideal male connector. The male connector is simply a solid cylindrical contact which, when mated with an ideal high pressure or multi-contact female, could take 10A. Not the answer you're looking for? Browse other questions tagged socket or ask your own question. What are the brass contacts inside domestic AC power plugs and sockets called? Are PLCC Chips/Sockets always the same pitch? Why were hobbyists advised to socket ICs before, but not now?